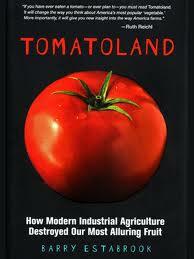 Tomatoland, by Barry Estabrook, takes the reader on a diverse, action-packed journey through the evolution of the modern tomato. All the facts are here (including the biggest question answered in the titled—yes, tomatoes are fruits! ), as Estabrook brings us from the mountain mothers of Earth’s first tomato-like plants to the fields of Immokalee, Florida, where the modern “tomato” gets new birth. But the evolution of the tomato is a rocky road. Sojourning from Immokalee to Lake Apopka and back down to our beloved Lake Worth (stomping grounds of some of our favorite swamp anarchist), Estabrook shows us the pesticide-ridden, alien fields, he meets the workers who toil in the fields for a less-than-living wage under constant threat of injury, slavery and even death, and he discusses law and direct action with the Coalition of Immokalee Farm Workers. At this period in history, with anti-immigrant laws passing throughout the US, a book like Tomatoland is like an oasis of honesty and sincerity. Out of the bleak quagmire of agribusiness, the harrowing stories told in Tomatoland of and by the Coalition of Immokalee Farm Workers are enough to set you on the edge of your seat. With little more than nothing, this rough-and-ready farm workers’ union has patiently fought for migrant farm workers, strengthening wages and health standards in the fields, bringing corporations like McDonald’s, Burger King and Yum! Foods to the bargaining table on their knees. While there is much left to accomplish, Tomatoland introduces us to a host of wonderful people who are in it for the long haul. After endeavoring through the processes that comprise the modern tomato—which has become less tomato-like than its Andean predecessors—Estabrook sinks down into his philosopher’s chair, providing interludes of illumination. “Uniformity is odious, variation sought after.” It is with this idea in mind that Tomatoland presents the reader with a more ideal version of commercial agriculture; a small, family farm in upstate New York. Growing funky heirloom tomatoes, the farm manager gets personally involved in the growing process, paying his workers above-minimum-wage salaries with benefits. Earth First! has long served the environmental community as a no compromise, direct action oriented group that works under the auspices of Deep Ecology. 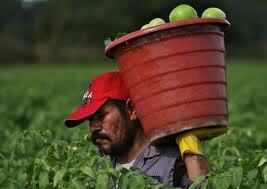 But we have yet to fully explore the potential of agriculture within that milieu. Estabrook offers us a beautiful chance to contemplate a post-collapse world, where open borders enable migrants and locals to come together, growing local, organic food on cooperative principles for a society that truly appreciates the labor of love.